A Manhattan Rain - Tazkara yearling chestnut filly purchased at the 2013 Magic Millions sale on the Gold Coast is being offered by Delbridge Racing for syndication. This filly is a well conformed yearling by the Group 1 winner, and half-brother to Redoute’s Choice, Manhattan Rain. She is already a well-developed filly physically with good bone and size. She will develop into a very strong and powerful racehorse. She has been broken in and appears to be a likely early runner. Her dam, Tazkara, is a half-sister to TASHELKA, a Group 3 winner in France. TAZKARA has produced one foal to race named ROWIE, and he has already won 2 races in Sydney and has performed very well in the 3-y-old Group races during the 2013 Autumn carnival. 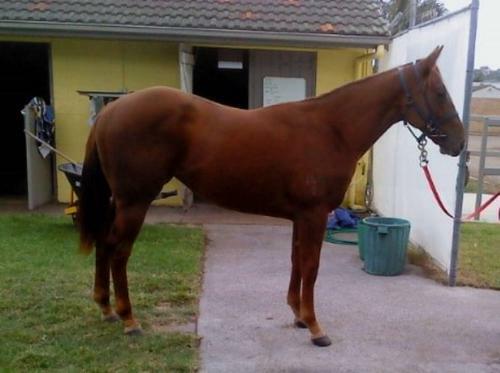 Trevor Bailey will train this Manhattan Rain filly at Newcastle, NSW. She is eligible for both the BOBS and Magic Millions series of races and incentive schemes. There are 2.5%, 5% and 10% shares available in the filly with a 5% share at $3240 each inc GST and costs to 30 June 2013. If you are interested in a share please contact us by email to admin@delbridgeracing.com.au or phone Mark on 0419561715.